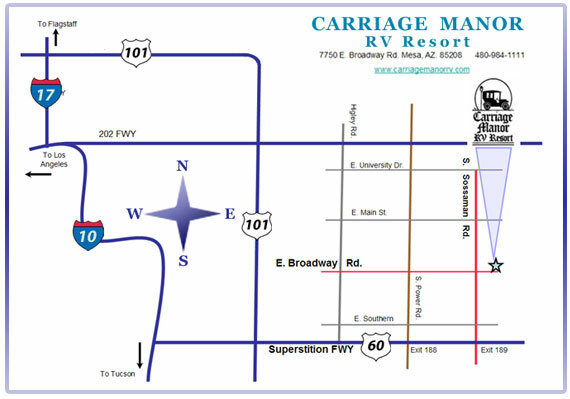 Carriage Manor Resort is ideally situated in beautiful Mesa, Arizona, 25 miles from downtown Phoenix and located conveniently to shopping, golf, Superstition Mall, parks, hiking, along with various shopping and grocery stores. 3 major medical hospitals are within a 5.5 mile radius of our location, including many medical offices. We're nestled just 10 miles from the foot of the majestic Superstition Mountains, about 2 miles from the Junction of US Route 60 and 2 miles from Loop 202, which loops the Phoenix valley area and surrounding communities. The entrance to Carriage Manor is between Sossaman Road to the West and 79th Place to the East and is clearly marked for your convenience. Get printable directions from your location, or click the map icon for a printable map. We've also made available enhanced driving directions to make your trip to Carriage Manor a bit easier to navigate.